How Is a Bridging Project Organized? Before we get into the nuts and bolts of the Bridging method we should understand the arrangements between all the parties in a Bridging program. Consulting the diagram above, any well run project of any size will have either an internal or external contract Program Manager who is technically and managerially competent, and to whom all parties report. 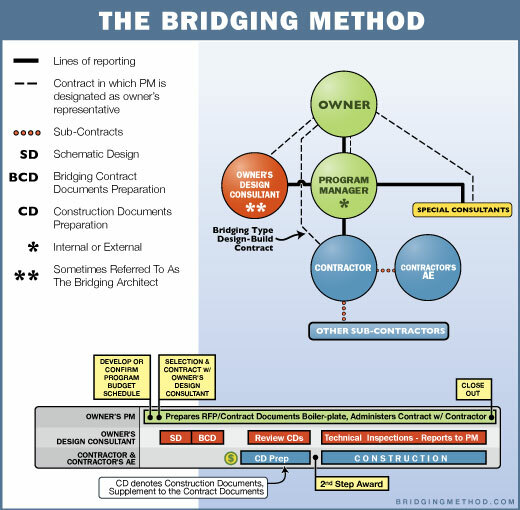 Those reporting parties in Bridging are the Owner’s Design Consultant (sometimes referred to as the “Bridging Architect” or the “Design Architect”), the Contractor with a design-build form of contract with the Owner, and the Contractor’s Architect (and consulting engineers) as a subcontractor to the Contractor to, or a member of the Contractor’s organization. Each of those reporting parties (including the Program Manager) is contractually bound to the Owner, with the Owner’s Program Manager acting as its representative. The Contractor also holds the other subcontracts.